When you’ve returned home from a holiday shopping trip cooking isn’t high on the priority list. If you’re like me, my first concern is eating because shopping is a work out and you have earned a treat for time well spent, devoted to hunting gifts for family and friends. Well, I have a plan for you. It is the turkey-dill havarti quesadilla that won over the household and took 10 minutes to make. Feel free to use (leftover) chicken, (leftover) ham, or beans if a vegetarian version is your thing. To me, the quesadilla is like the sandwich- so many options but just a few ingredients can really make it awesome. Instead of plain havarti I experimented with lite dill-havarti – a cheese speckled with fresh and subtle dill that melts beautifully. Dill has been known to have a soothing quality (think: Christmas music at the mall – soothing herb is necessary). Add in a couple sweet banana pepper rings and you have a fantastic combination of flavors. Paired with tomato soup, this meal is like slippers for your tummy, making you feel all warm and happy. Even if you prefer to do your holiday shopping on the internet (escaping the cold harsh mall climate), I still think you deserve a quesadilla or two. Heat oil and melt butter in a small fry pan. Add shallots and saute until soft and slightly carmelized. Add water if pan gets too hot or pan gets too dry. Set shallots aside. Heat skillet over low-medium heat. Lightly butter one side of a tortilla and place butter side down onto skillet. Top half with 1 small palmful of cheese (this is really a personal preference so add as much as you like). 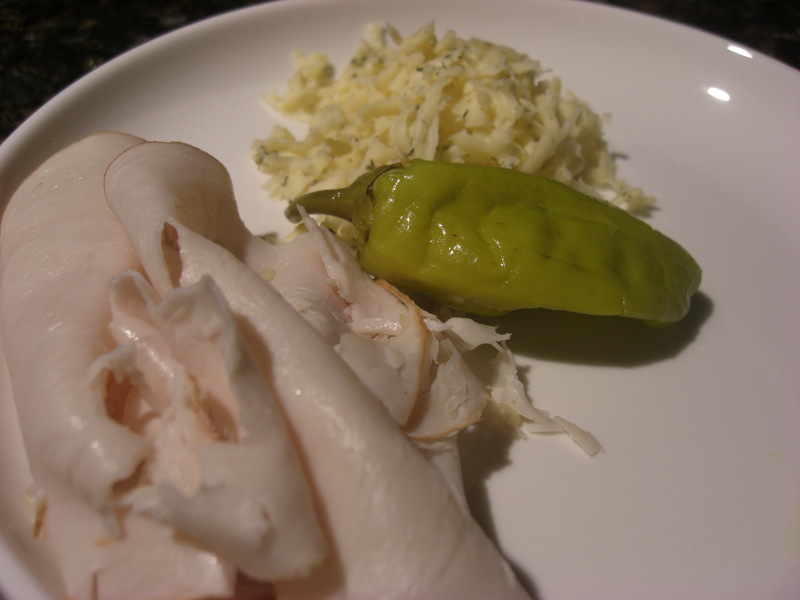 Top cheese with some carmelized shallots, turkey slices, and banana pepper rings. 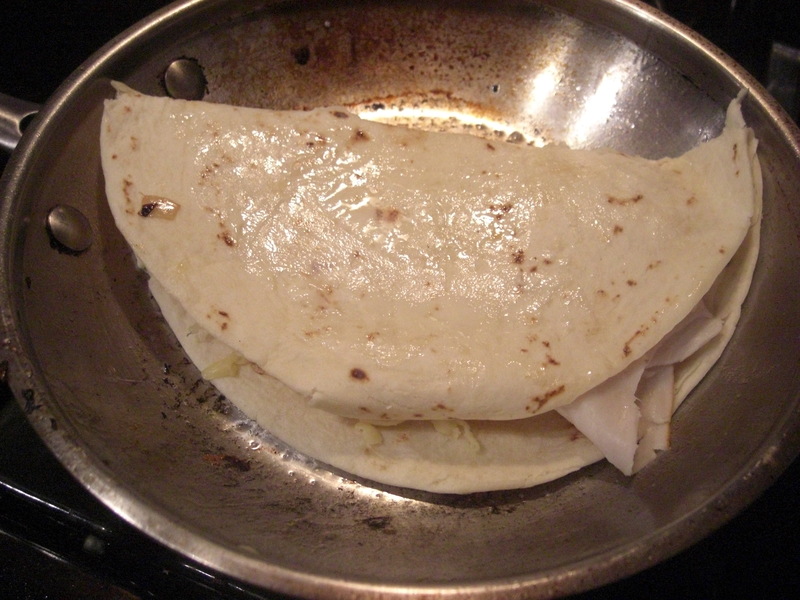 Fold bare half of tortilla over and hold down with a spatula until it stays on its own. Cook for about 3 minutes or unti lightly golden. Flip and heat through and other side is golden as well. Serve with additinal pepper rings and sour cream. I highly recommend serving with soup, such as creamy tomato. This looks mmmmmazing!! 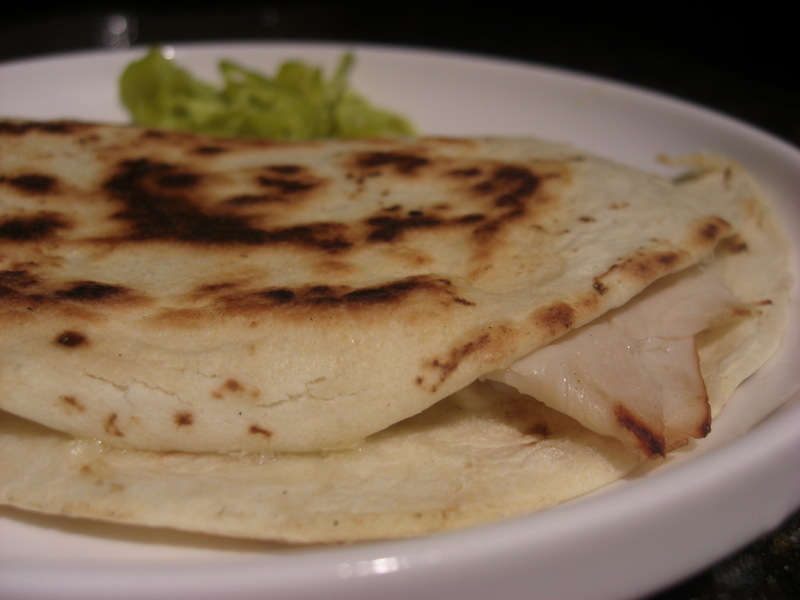 Maybe we can have turkey-dill havarti quesadillas for NYE?!?! 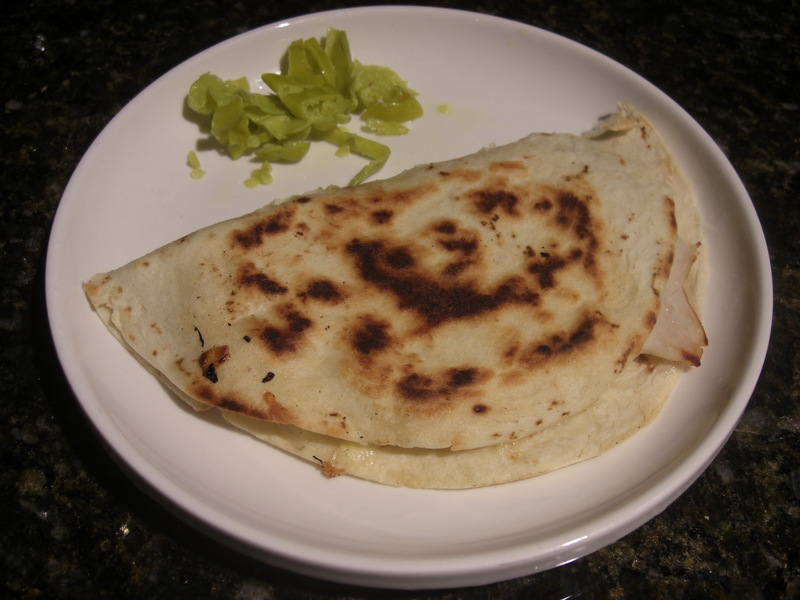 I love quesadilla….I usually make pancake versions, with cheese and ham. This sounds delicious. I guess Turkey leftovers would also work well and thanks for the soup tip!